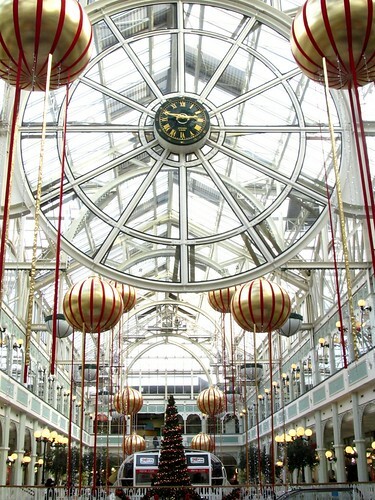 The city of Dublin was bustling this afternoon, teeming with bargain hunters looking for discounted best buys post-Christmas celebration. My cousin and I were one of them, opting to shop around Grafton Street area, including in St Stephen’s Green Shopping Centre. The Christmas decors were still in place when we were there. I like it that the management didn’t overload the premises with baubles, tinsels, wreathes and fairy lights. I’d imagine these decors won’t stay up for much longer though. It is Epiphany tomorrow; traditionally this marks the time has come to take down Christmas trees and relevant festive decorations. m3d, that’s right, it’s just round the corner – the year of rabbit, right? sila, thanks and many happy returns to you. it’s good to be back in dublin, even if just for a little while.